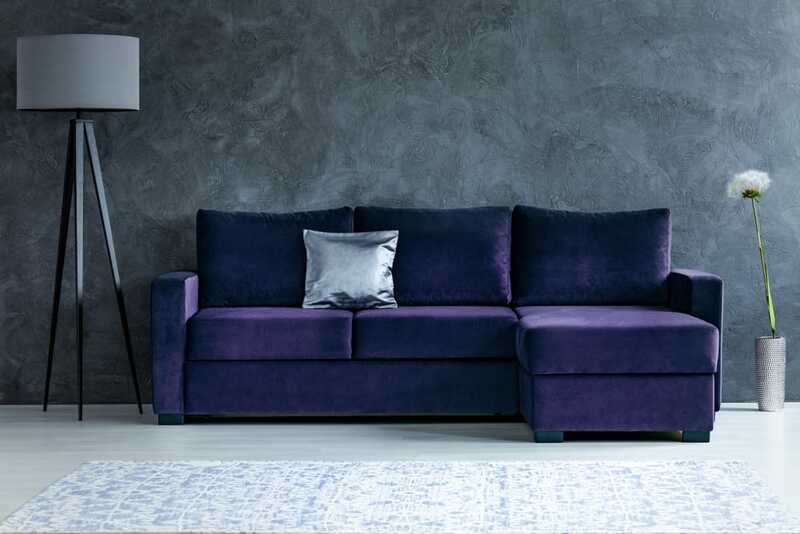 From pale lavender to vibrant shades of violet, purple offers a wide range of soft and elegant tones that can be integrated into your home décor. Lots of rooms can take advantage of a bit of purple style whether as an accent or for a complete makeover. This is the kind of hue that offers a mysterious vibe and is certainly capable of capturing the attention. If you’re interested in working with a purple color scheme, we’ll explore some interesting ideas to help you out. Thanks to its sophisticated richness, purple has a considerable visual impact for any room. It will elevate the ambiance and create a comfortable environment to express your creativity. This could be an excellent color choice for those who enjoy various artistic pursuits in their own home. 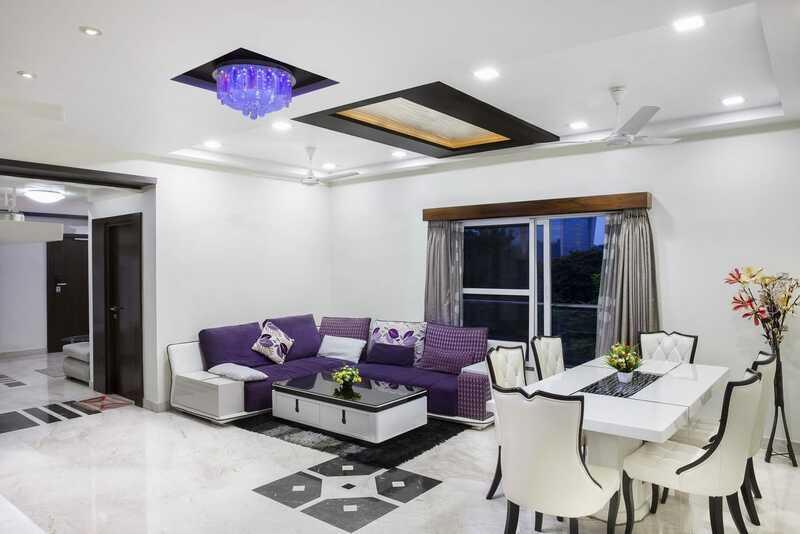 Designing the space with purple decorations can take a bit of work to pull off the desired look. It’s important to use it correctly to make a thoughtful statement or to add passion to the room by using it as a complementary background color. Decorating with purple isn’t as difficult as it may seem. One of the most obvious solutions is to incorporate a large furniture piece like a chair or a sofa. The richness of this shade is further enhanced by its ability to absorb light. 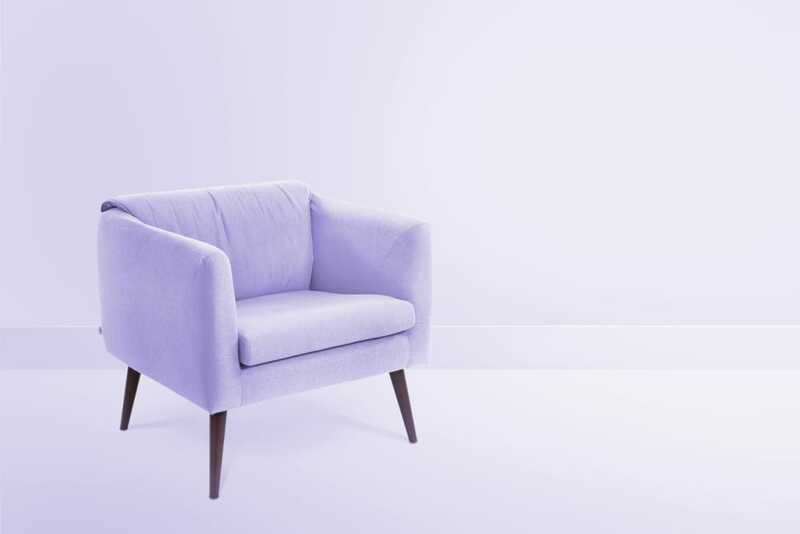 When you pair a purple chair with a background that’s colored in a similar tone, you can achieve a visual balance. The purple wall here creates a more cohesive look preventing the vibrant furniture from standing out too much and looking out of place. Purple has a certain intensity which many people wish to use when creating a bold statement. 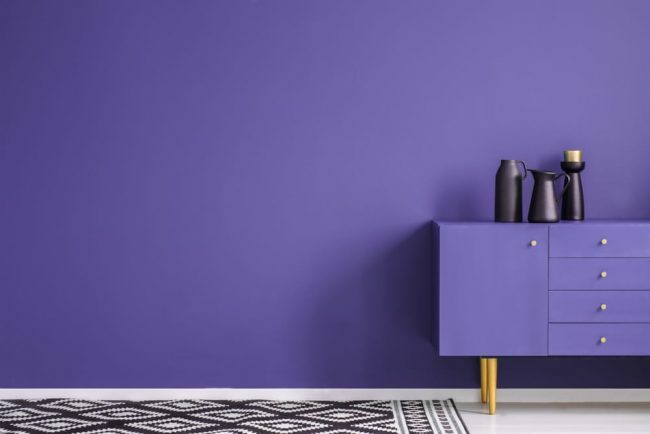 In a colorful room, purple won’t have that much of a visual effect but keep the color scheme in a neutral area, and you will immediately notice its vibrancy. With white and beige overall elements, purple offers a beautiful contrast when it’s integrated through a simple item. It can be a furniture piece or an accessory such as curtains for the windows. Regardless of choice, neutrals can benefit from a pop of color brought by this mysterious-looking shade. Through the addition of multiple purple accent pieces in a room, you can breathe some new life into an otherwise bland-looking space. Instead of going for one big purple element which can have too strong of a visual impact by itself, you should consider bringing smaller details to enhance the overall look of the room. By layering multiple tones of purple, you can create a designer look that’s sure to boost the wow factor. Any neutral living space will become more memorable as purple accents give it a new personality. Purple also has the ability to bring in some relaxing vibes and warm up an ordinary room. This effect is especially noticeable when you introduce purple elements with soft textures like cozy blankets and fluffy pillows. We recommend a plush throw blanket in a rich purple tone like this model from Amazon. Another great accent is this pack of decorative purple pillowcases. One way to integrate some more purple into the room is through lighting fixtures. 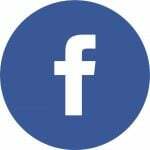 There are some very good options to consider here and one of our favorites is to get a table lamp. You can find models with fairly simple designs, but purple deserves a more intricate look to show off its true richness. This is why we recommend going for a table lamp with a mosaic tiled base like this chic model from Amazon. Instead of a simple and functional piece, this lamp is also gorgeous and adds a touch of uniqueness to the room. As we feel that purple has a mysterious and exotic vibe, it’s natural to associate its vibrant characteristics with Moroccan-style lanterns. Here’s another great solution for taking advantage of purple’s decorative potential. This purple lantern found on Amazon has all it takes to add some Oriental flair to the room. It may be the last element to complete the dramatic Moroccan look. When decorating a room with purple, you need to pay attention to the intensity of the shade. Softer purples work best when you’re trying to go for a clean and fresh look. Pale lavender tones can seem girly in some spaces, but a light purple has the ability to brighten up a room and give the furniture a cheery vibe. Lighter purple tones match well the bedroom as they provide a sense of serenity. It’s not surprising how these purple shades are often preferred when designing a yoga studio. Pale purple has a soothing quality that encourages relaxation and meditation. On the other side of the coin, we have darker shades of purple which are usually associated with royalty. They inspire feelings of grandeur and rich elegance. 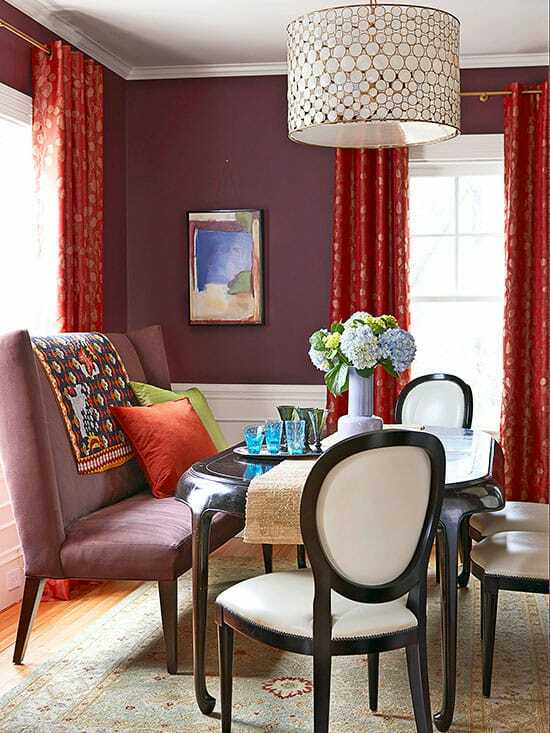 If you plan on giving the room a more serious tone, it’s recommended to go for dark purple instead of light purple. Dark shades of purple work best when they’re used to their full potential. That means you should be willing to commit to their striking boldness. Think of painting all the four walls in a room or another major makeover like that. If sticking only to deep purples sounds too formal for your tastes, try to integrate some lighter tones for a warmer and cozier atmosphere. 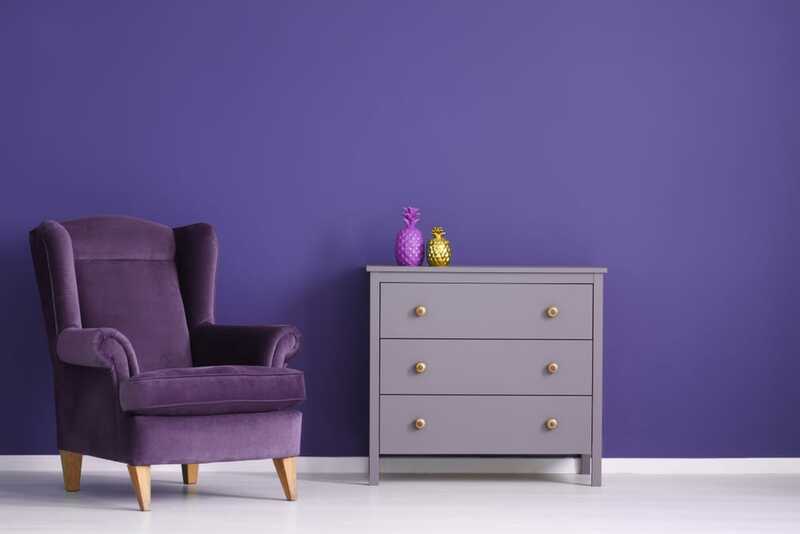 An easy way to update the look of a room with the help of purple is to paint the wall. This is a bold, but efficient move in terms of both aesthetics and functionality as purple walls create the kind of atmospheric effect that stimulates creativity. The shade used in this picture gets pretty close to the darker side of purple. Gold accents are used to balance out the look with some necessary warmth. Purple’s majestic look can be extended to various corners of the house. The window area is a good spot to decorate with purple if you just want to make a quick refresh to the area. Adding some lush purple curtains will bring some luxurious vibes to the room. A soft touch of purple can be enough to create a more inviting place. 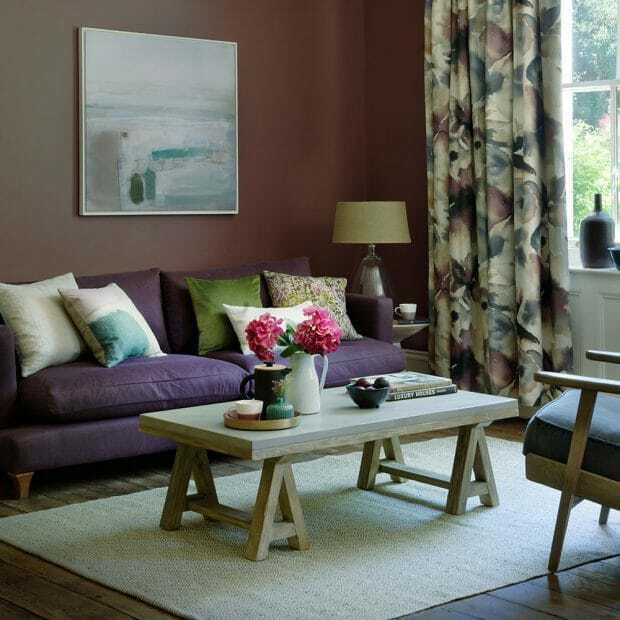 With the right décor pieces, purple curtains can also contribute to a more sophisticated look. There are many stylish options when it comes to purple curtains, but we recommend ombre drapes if you want the room to stand out even more. Here’s a beautiful set of blackout curtains from Amazon that showcase an elegant purple color gradient. Those who like the classic grey look which inspires a sense of modernity will probably love how well it can be combined with purple. All kinds of grey shades, from silver tones to dark charcoals, can make a memorable duo with purple thanks to the superb contrasting effect. The bedroom is a good area to consider if you wish to take advantage of this color combination. The grey wall provides an excellent background for the vibrant bed in different violet shades. The artwork on the wall ties the color scheme together. 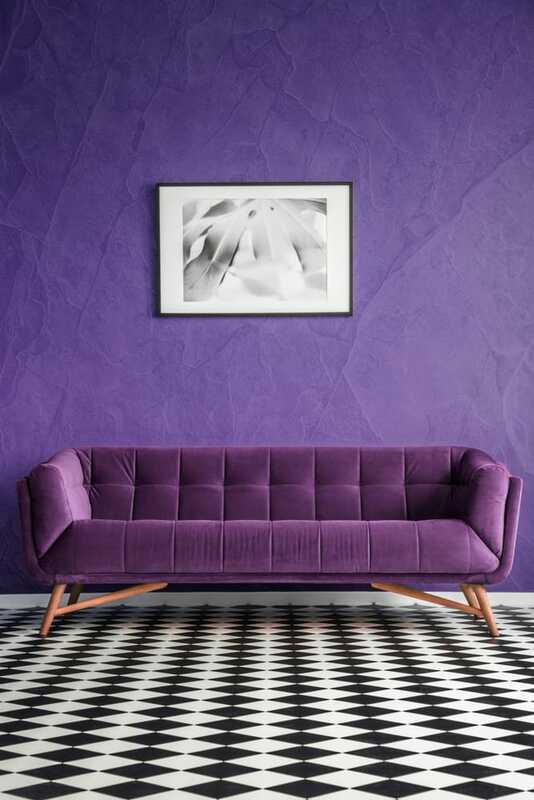 If purple walls give off a strong hint of boldness, purple wallpapers can take the effect to new heights. This is because there are patterns and textures you can play with to achieve a unique design. 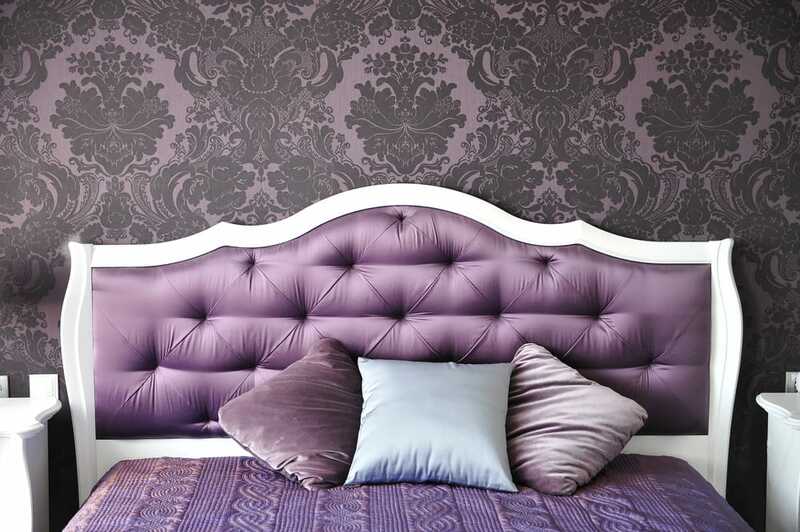 An elegant bed that’s decorated with purple has a regal feel, but the wallpaper behind it enhances the look even further. The result is a rich purple design with more texture and interest. 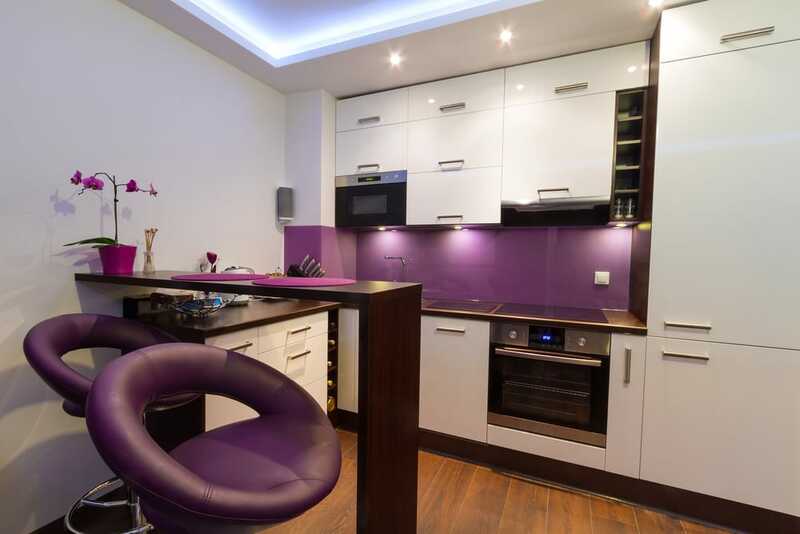 A kitchen that’s predominantly white or neutral-toned will look amazing when you throw some purple in. The way the backsplash has been decorated here with a pale shade of violet offers an exquisite contrast with the modern white cabinetry in the kitchen. The dark purple bar stools also contribute to a harmonious look. The final touch that brings everything together is the addition of subtle accents like the vibrant orchid with a matching planter. Purple is more unusual for the kitchen, but it can bring a cheerful vibe making this space feel more welcoming. The dining room is an important space in the house where you will receive guests so making this area feel warm and inviting should be a top priority. You can do this with purple while at the same time maintain a bit of formality and elegance that’s sure to create a memorable impression. The soothing dark orchid purple touch of the wall in this dining room is definitely a standout feature that sets the stage for many jubilant evenings. We’ve already mentioned the power of gold accents to brighten up purple pieces and maintain a more balanced look. Here’s another example which offers some Mid-Century vibes considering the decorations used. There are different shades of purple used to create a cohesive design. Touches of metallic shine take the elegance of the furniture pieces to glamorous levels rendering the atmosphere sophisticated with just the right amount of carefree vibes. Dark violet shades can transform any bedroom in an exquisite place. 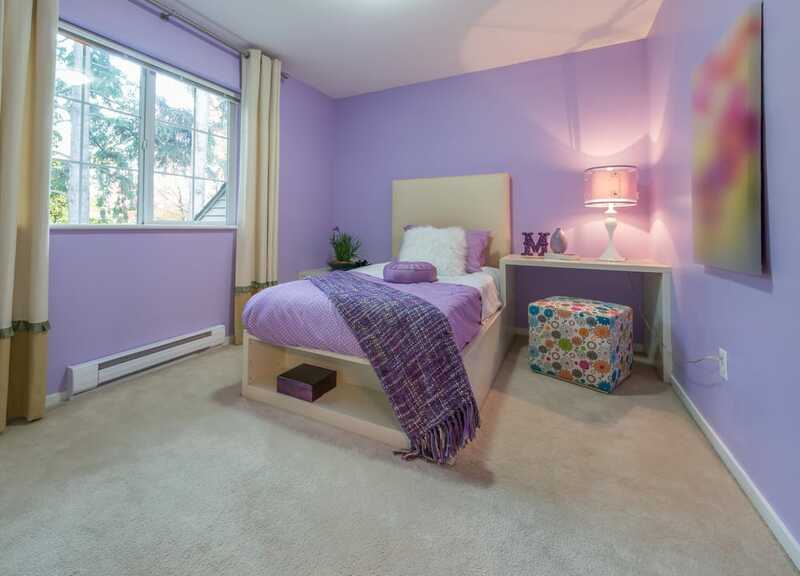 Purple has a more special effect when used for the bedroom as it represents a signature of your personality. By choosing deep purple elements like the bedding, table lamp, and rug, the overall impression is one of profound elegance. The painted walls emphasize the dominance of purple in this room. At the same time, some healthy levels of coziness are retained through the addition of a minimalist fireplace and wooden floor. This is important as the bedroom needs to be a comfortable place where you can relax. The bathroom is a highly functional room that often gets overlooked in terms of decorations. 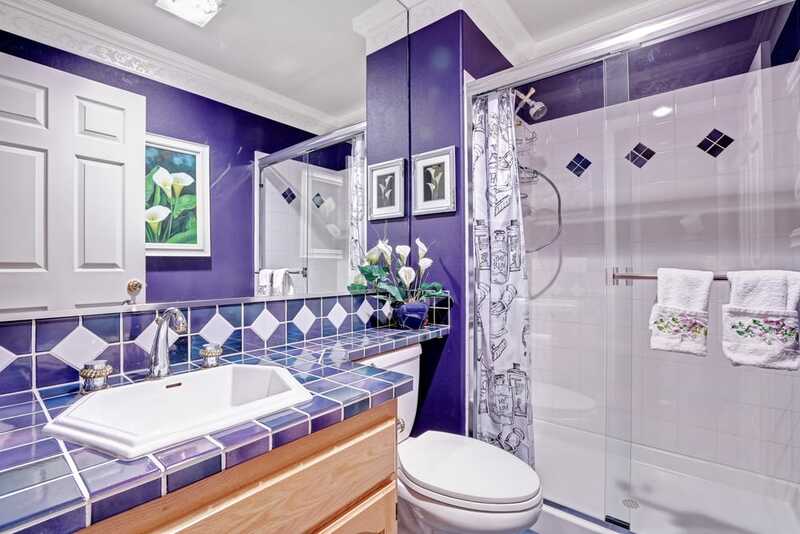 If you want to set your bathroom apart from the crowd, going for purple tile and painted walls represents an excellent choice. A nice splash of color is welcomed in this area. Make sure you select a soothing shade of violet to transform the bathroom in a stylish way. We’ve seen how beautiful purple mixes with grey tones, and white looks good too when combined with this color. Even though purple and white don’t make the most popular combination, the resulting contrast can be highly effective to achieve a particular look. When you choose pale shades of violet to mix with white, you should be able to bring to life a more feminine look. This is a recommended choice if you feel like the contrast of vibrant purple and white seems too strong for your tastes. Certain shades of purple have a strong ability to blend with a vintage décor style. This vibrant orchid purple looks fabulous against the washed-out elements that are more specific to the vintage look. All the ornate details from the furniture craft an elegant look together with the warm shade of purple. Purple is the color of choice for people who love more creative looks. It’s one of the best solutions if you wish to redecorate a room without sticking to the usual conventions. 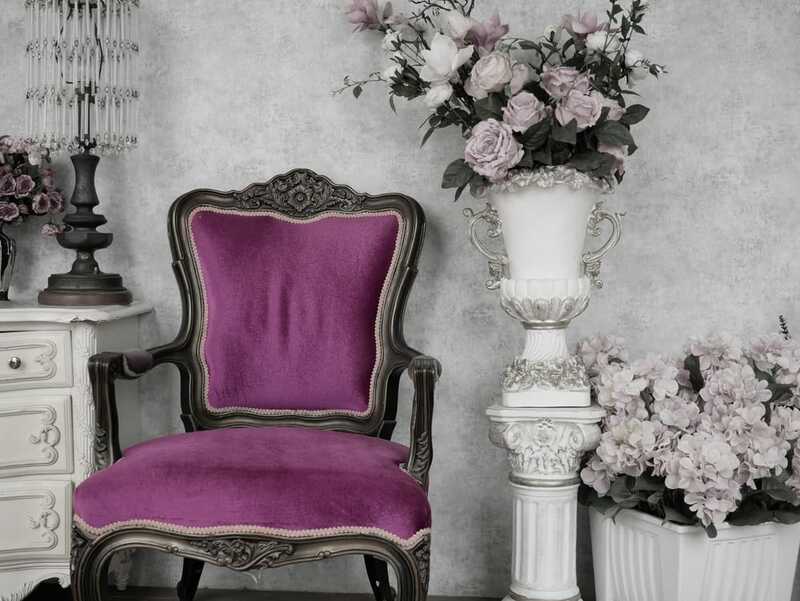 Here we see purple in action as it complements a baroque-styled room. The white and purple stripes on the wall add some visual interest to the whole space. To keep the color theme consistent, the designer went for a purple floor while the ceiling’s neutral tone matches the rest of the furniture. If you’re not satisfied with the integration of some subdued purple accents, you should take into account the potential of patterns to create a more daring look. The otherwise plain-looking windows in this room are enhanced by the stylish set of patterned drapes with horizontal lines. 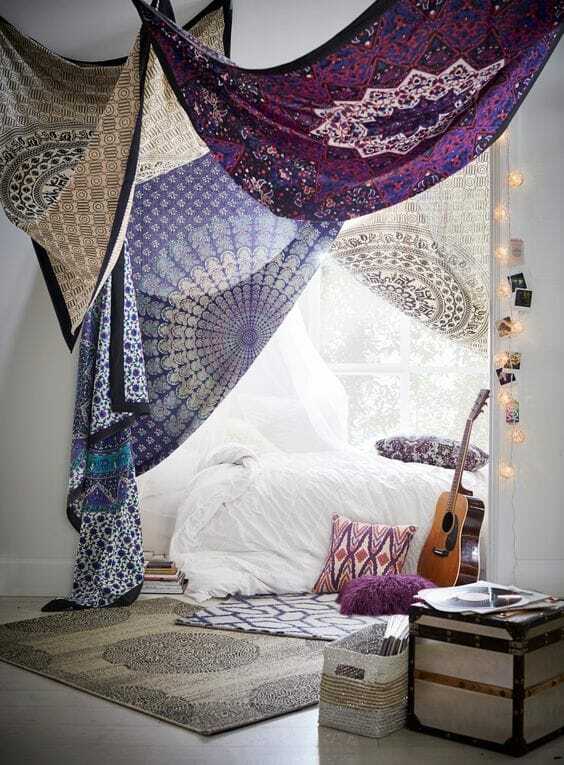 It seems like a more inspired choice compared to full-color drapes given the look of the rest of the room. Pastel shades of purple that almost stray into pink territory work great for decorating a kids’ bedroom. Both the bedding and walls create a restful sensation for the room while adding enough color to keep a playful atmosphere. Adequate natural and artificial lighting also emphasize the coziness of the room. The industrial interior design style doesn’t usually include purple in its standard color scheme. For a more eclectic touch, you should consider the striking combination of a purple element like a bed with a brick wall. The clashing of styles and vibes might be a little too much for some people, but if you want to create a unique look, this is certainly one way to go about it. Purple makes a good impression wherever you choose to incorporate in your home. The home office is no exception as purple can elevate it and make the atmosphere more elegant with just some simple accents. A complete makeover for the wall or large purple elements can be a bit too strong for this area, but subtle touches of mauve give off just enough vibrancy to enhance your productivity. First impressions matter the most when it comes to many aspects, including your home. What better way is there to make a great first impression than by welcoming guests through an entry door that’s colorful and bold? Purple could be a memorable choice for the entry door and if you choose a deep and rich shade of violet, you’ll be sure to make an impression of grandeur. 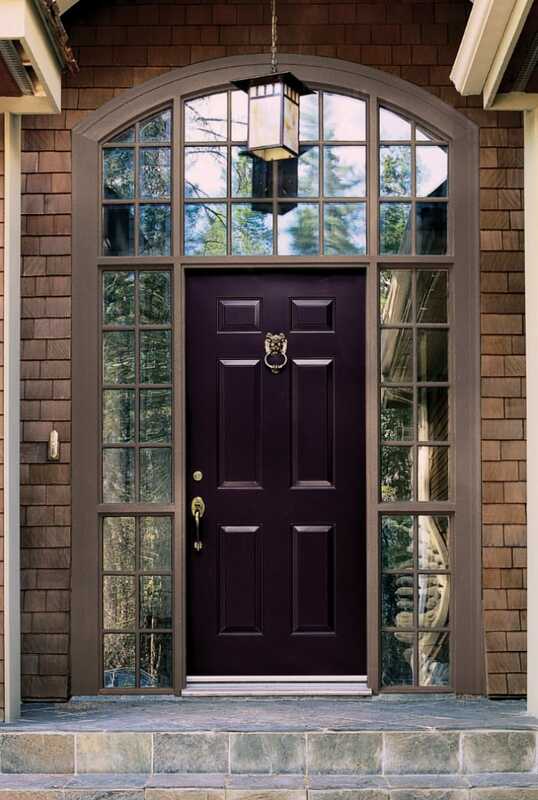 Going for a purple entry door represents a good idea as this color has been often associated with royalty. It will make a solid first impression suggesting that your home is prosperous. If you wish to take it a step further, consider matching the purple tone of the door with the window shutters. There are many people who consider purple to have healing powers. Something about this color can create a tranquil ambiance and relax your mental state. This is the reason why it can be successfully integrated into your meditation space. Purple contributes to soothe your anxiety and induce a sense of calm when you wish to get away from the stress in your life. Your retreat area can definitely benefit from a touch of purple. When used indoors, purple has a striking visual effect, and there’s no reason why you can’t achieve the same impact when moving outdoors. The patio is one area that can be dressed up with some purple accents which match very well the surrounding greenery. It’s not always easy to decorate outdoor spaces like the patio, but purple has the ability to keep things fun and fresh. A more innovative idea to incorporate some purple in your garden is by growing some lavender bushes. These plants are relatively easy to maintain and can add some vibrant splashes of purple through their elegant blooms. With a mix of eggplant purple and platinum gray, this a very attractive rug that brings a colorful flair to any home. The geometric motifs can also complement a wide range of interior design styles. 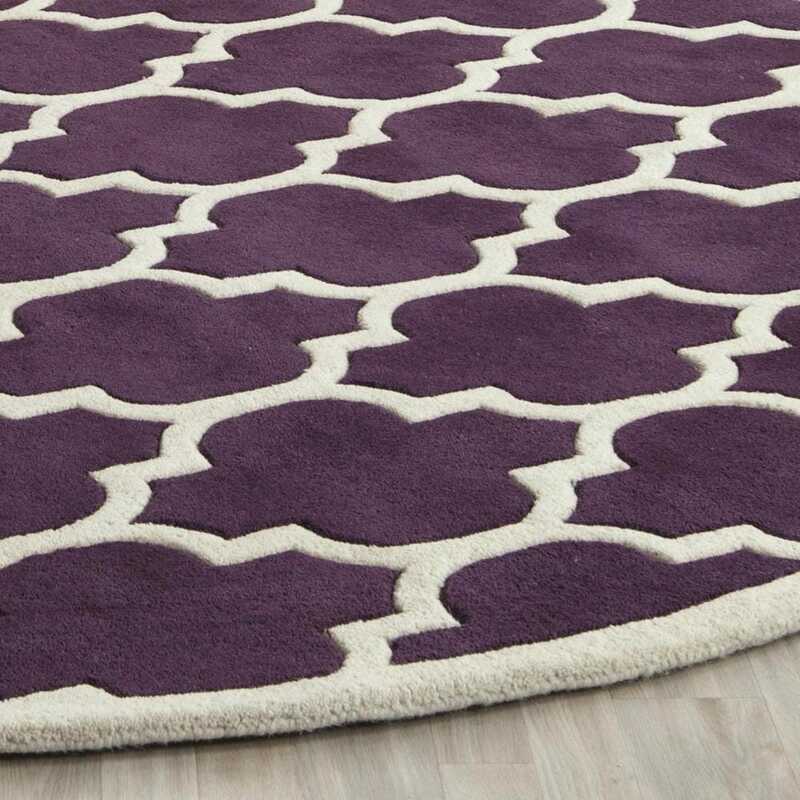 Check out a lovely rug on Amazon if you’re looking for creative ways to decorate with purple. This rug is easy to clean and doesn’t shed. It doesn’t just add a superb decorative dimension as it also provides a comforting and pleasant feeling underfoot. If you love bringing as many jewel colors into your décor as possible, consider including purple into the colorful mix. This room has a few boho style vibes, but the overall look remains modern due to the inclusion of contemporary furniture pieces. Purple from the walls, gold from the coffee table, and blue from the couch blend together with the vibrancy of the rug and throw pillows giving the room an eclectic personality. In case this look feels too chaotic for you, it’s highly recommended to use some layers of neutrals and darker greys and simply let the colorful accents to evolve in a playful manner. This look has great potential thanks to the colorful elements that add plenty of character and maintain a perpetually fresh design. 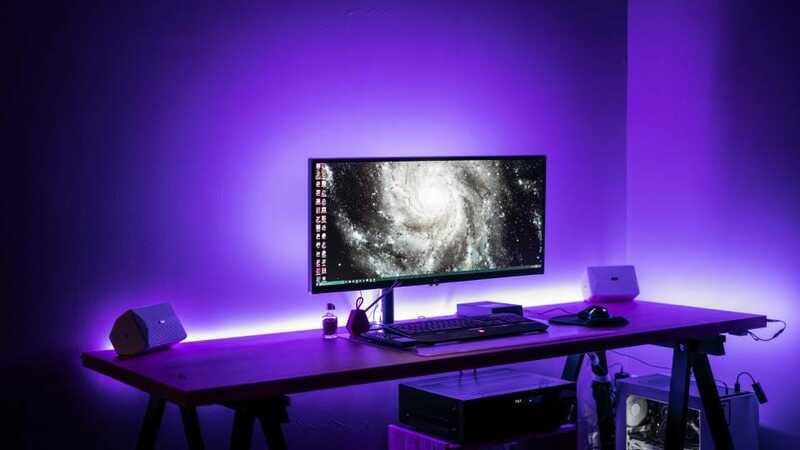 A high-end workstation can take advantage from the colorful effect of violet lighting. If painting the walls seems like too much effort, you can always bring some purple vibes through dark violet illumination. The resulting atmospheric effect can easily match your gaming rig and provide the perfect background for all kinds of productive or fun activities. Many people avoid purple when decorating their homes thinking that it feels a bit too overpowering. 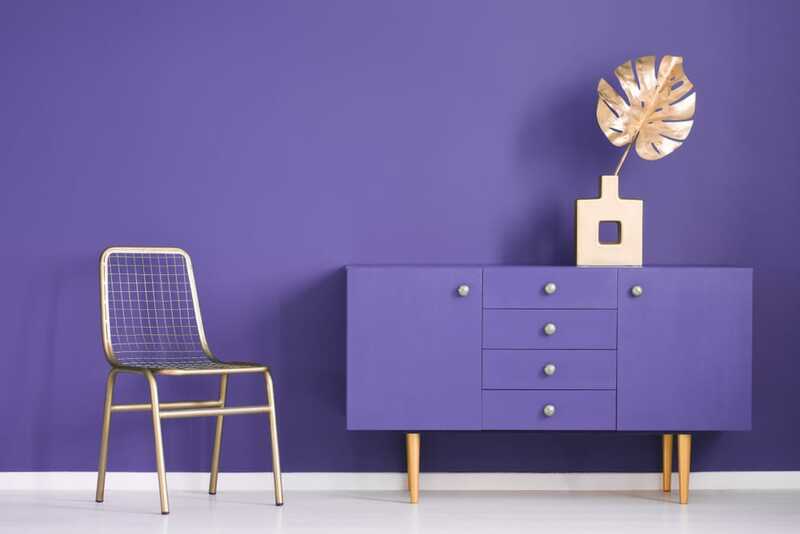 A simple trick to include purple without making a scary impression is to choose a mellower shade, something that’s closer to brown than blue-based purple. The idea is to retain a decent level of sophistication while maintaining some casual vibes. In this example, we like how the rustic table fits with the stylish purple sofa. 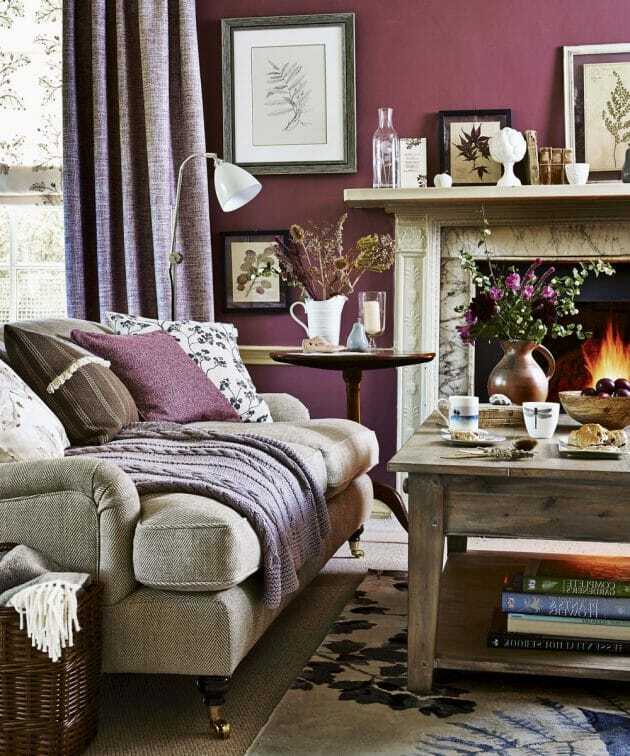 Those who prefer a bit of hygge flair into their decorations will probably like the cozy look achieved in this room with the help of plum purple tones mixed with earthy textures. 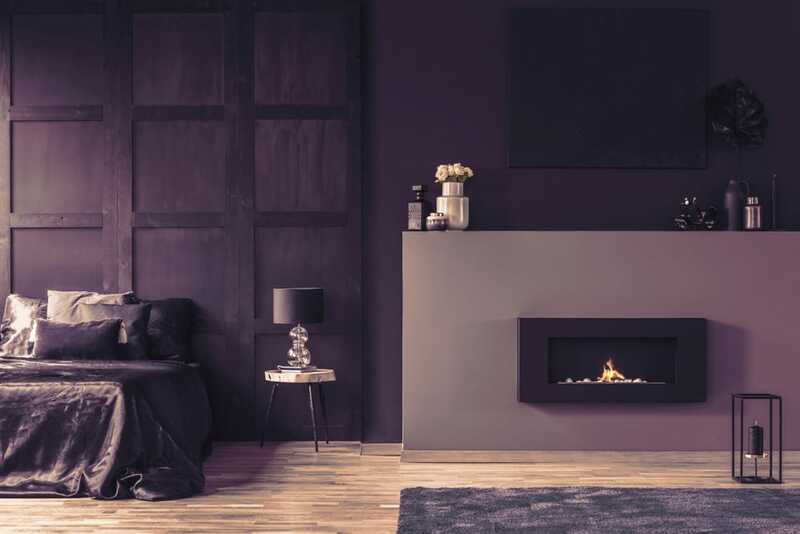 The elegant fireplace turns up the coziness making this room a beautiful retreat during the winter season. Purple is used here quite sparingly. The most striking visual impact comes from the wall, but the overall elements in the room stick to a neutral color scheme that takes your mind to rustic cottages. Plenty of autumnal decorations together with warm blankets and throws complete this cozy look. A purple shade with great potential for decorating your home is the luxuriant amethyst color. With some yellow elements, it can make a very colorful statement as this combination is known for creating a festive impression. 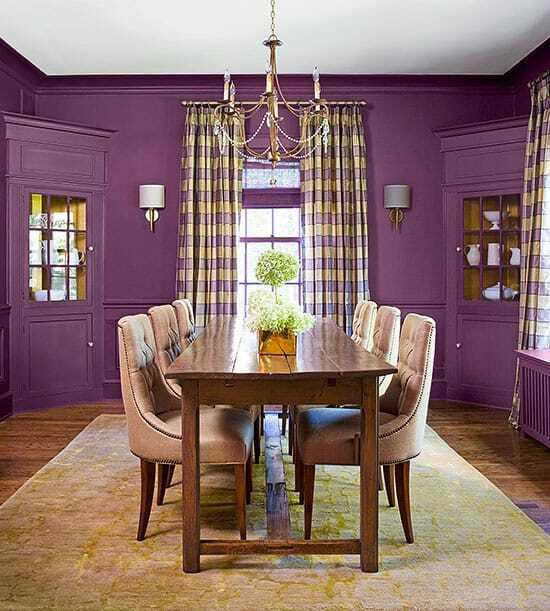 This dining room benefits a lot from the strong amethyst vibes from the walls as the room offers an ideal background for lively conversation. 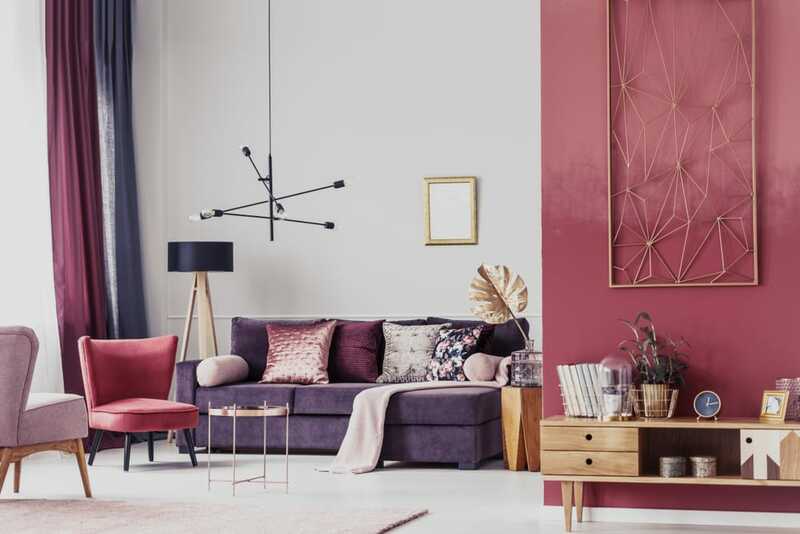 Mixing red with purple makes for a vibrant aesthetic even if the combination seems a little unusual at first. Not all designers will like the look of these two shades together, but we think it’s a brilliant look if you pull it off just right. 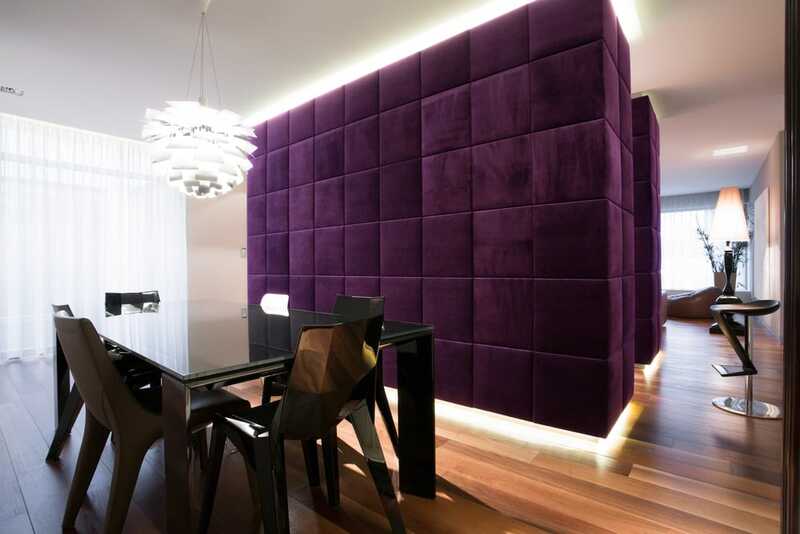 A good example is to start with the walls and paint them with a more subdued shade of violet such as eggplant purple. When you add some fiery red accents like crimson drapes, the result is quite daring indeed. To soften the scene a bit, there are some neutral-toned elements such as the chairs. As if there wasn’t enough visual interest, the attention is once again captured by some colorful blue and green accents. 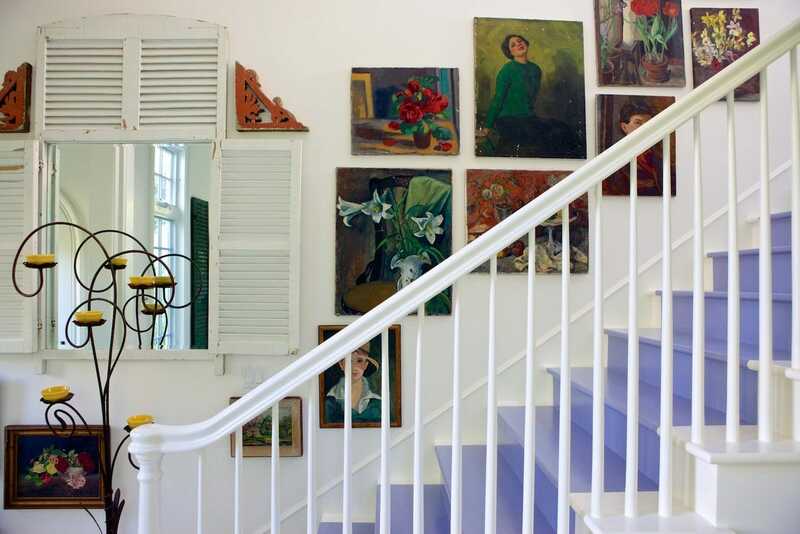 Painting the stairs represents a quick solution to freshen up their look. There are many color choices that can work to create a stylish contrast. If you wish to add some mystical flair to the stairs, one of the best ideas is to go for purple when deciding on the right paint. The mauve-colored stairs here feel quite unexpected making an enchanting impression at first sight. 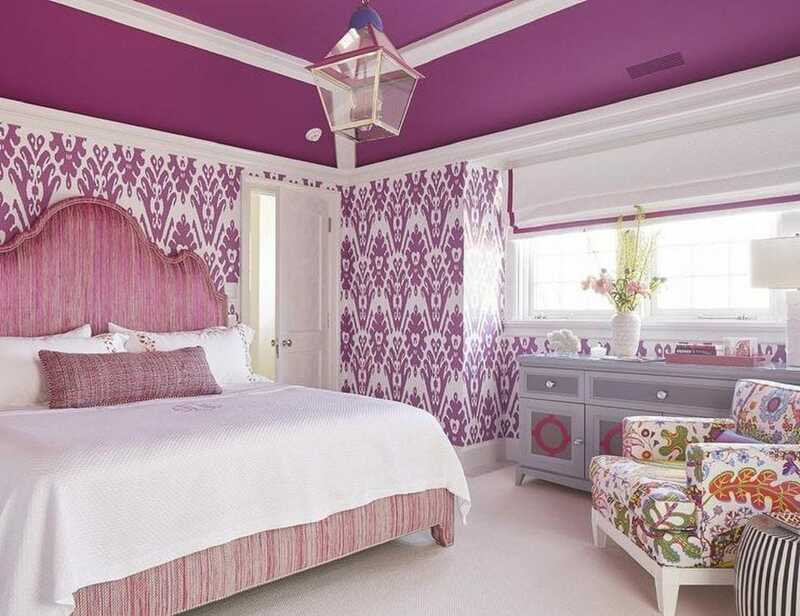 Here’s an interesting way to integrate some beautiful purple into a room – just paint the ceiling. This bedroom makes use of a stunning orchid purple which is an instant attention-grabber. To keep the color scheme consistent, there are also stylish patterns used to decorate the walls in the same purple tone. Whereas dark violet creates a sophisticated atmosphere, the purple shade here feels closer to pink which translates to a more feminine and delicate look. The Gothic style frequently makes use of dark colors and purple seems to fit very well into its usual color scheme. 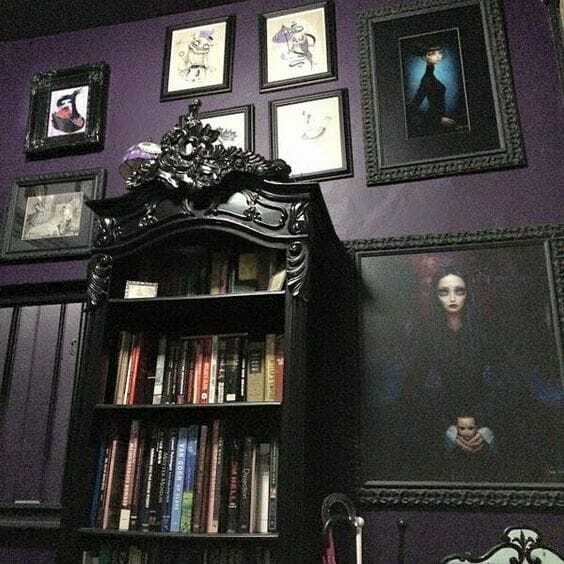 A dark purple wall offers an ideal background to show off some ornate furniture pieces like a bookshelf or various artworks. The combination of violet and black seems like the perfect match for those trying to pull off a Gothic look. If you want to live a colorful life, you shouldn’t miss out on the decorative potential of the purple and turquoise duo. The bedroom’s look can be easily updated with the help of a comforter and pillows in matching tones. Mauve shades appear to dominate in this room and the turquoise serves more like a slight accent to keep a solid visual balance. There are lots of playful patterns at work here creating a whimsical ambiance.